Londoner Adam Penney opens Three Buns Restaurant in Jakatar, by PTT Family Group. As Jakatar quickly establishes itself as a slick, upcoming capital, PTT bring their critically acclaimed design and community oriented ethos to the borough of Kebayoran Baru. Making the move from the Michelin Star to Indonesia’s hustle and bustle, Penney takes inspiration from soul music, a passion for good meat and mouth watering flavor. Combining his powerful, soulful food, and PTT’s innovative, fresh design, Three Buns embodies this city’s progressive movement towards sophisticated, youthful establishments. 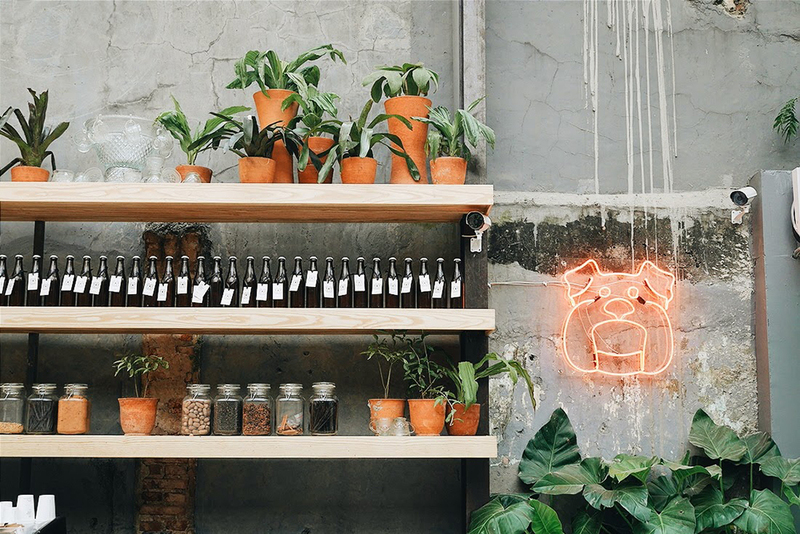 PTT Family have brought us several Potato Head spots within the capital as well as the Beach Club in Bali, and Three Buns adheres to their open, welcoming approach to restaurant design. The layout abides by their communal philosophy; flowing outward and upward from the open kitchen, the restaurant resembles an amphitheater with tiered seating and sky-high ceilings. Full visibility of the chefs at work with a self-service kiosk, the atmosphere is playful and relaxed. 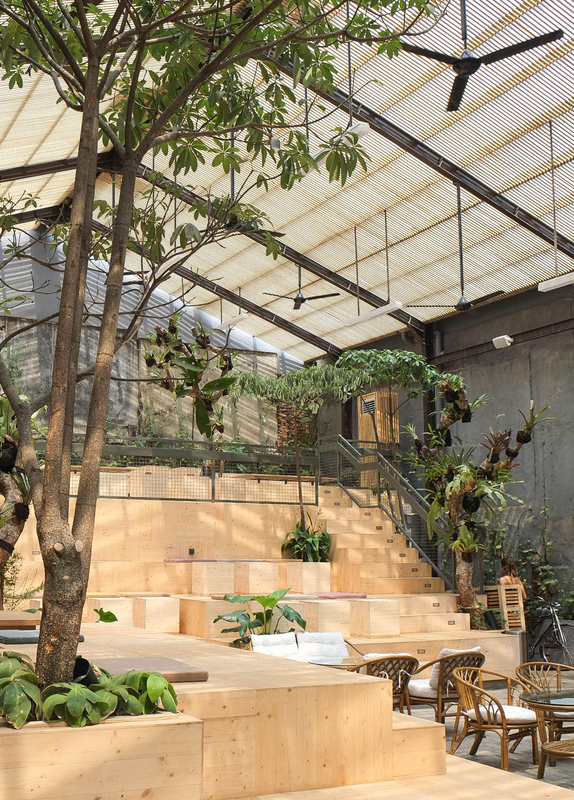 Taking advantage of the voluminous space which resembles a giant greenhouse, PTT’s Ronald Akili and Jason Gunawan have created a cool, contemporary oasis. Semi al-fresco, nature permeates the design as trees clamber throughout the furniture, raising leafy heads among the wooden seats and benches. Without overwhelming the décor, the foliage brings the outdoors in, and invites guests to indulge in a refreshing getaway from the hectic heat of the surrounding city. As head-chef Penney’s attention to detail sets his burger & cocktail menu apart from the usual trendy restaurant pitfalls, PTT’s design offers clever quirks to compliment his vision. Edgy, minimalist structures such as the Japanese style bar and seating are softened by the natural color palette and brightened by the brand’s playful artistic additions. 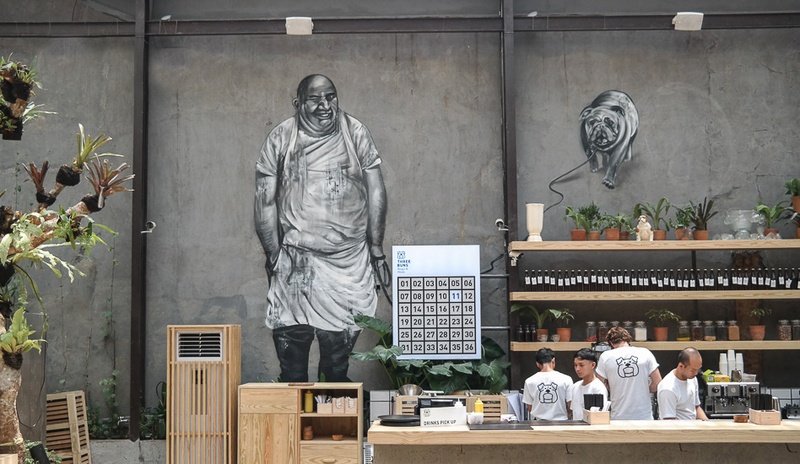 Graffiti by local Bernard Suryaningrat which he calls “The Butcher” depicts a big burly chef (bearing a slightly unflattering resemblance to Penney) looming behind the bar, and the mascot bull-dog’s smiling face appears pops up throughout. Determined to make a positive impact on the community by supporting local cultural activity, Three Buns is due to make a significant mark on Jakatar’s thriving restaurant industry. With a sister restaurant due to open in Singapore, it seems this is an idea worth sinking your teeth into.